Samuel “Sam” Ketchum (18? ?-1899) – Hailing from San Saba County, Texas, Sam grew up to work along with his younger brother, Thomas “Black Jack” Ketchum, as a cowboy on several ranches throughout west Texas and northern and eastern New Mexico. However, by 1896, the pair had turned to a life of crime, robbing businesses, post offices and trains in New Mexico. The two soon formed the Ketchum Gang which included a number of other outlaws, including Will Carver, Elza Lay and Ben Kilpatrick, who also rode with Butch Cassidy’s Wild Bunch. However, everything began to fall apart when Sam, along with Will Carver and Elza pulled a heist without Black Jack on July 11, 1899 in Folsom, New Mexico. Though they made off with some $50,000, they were soon pursued by a posse to a hideout near Cimarron, New Mexico. 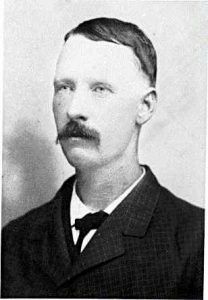 In the ultimate shootout that occurred, Sam Ketchum was seriously wounded, and Sheriff Edward Farr was killed. Carver and Elza were able to escape, but Sam Ketchum was taken to the penitentiary in Santa Fe, where he later died of blood poisoning on July 24, 1899. He was buried in the Odd Fellows rest Cemetery, now the Fairview Cemetery on Cerrillos Rd. in Santa Fe.